Picralima nitida (Stapf) T. Durand & H. Durand (Apocynaceae) locally known in Ghana as Akuamma (Asante-Twi) is widely used in West Africa for various medicinal purposes including infections and pain . The rich alkaloidal nature of the plant accounts for majority of its pharmacological actions [2 – 3]. Although a number of scholarly studies exist on the plant (eg. analgesia, anti-inflammatory) , its in-depth effect on the CNS has not been explored. The aim of our research wa to investigate the stimulatory and depressant effect of the crude alkaloids of P. nitida. Powdered seeds were de-fatted in petroleum ether, cold macerated in 10% v/v HCl, basified with 36% v/v NH3 and solvent-solvent extracted with CHCl3 to obtain the crude alkaloids (PNE). The effect of PNE (30 to 3000 mgKg-1 p.o.) on behavioural and physiological functions was assessed using Irwin's model in male ICR mice . The sleep effect was further investigated in pentobarbitone interaction test . 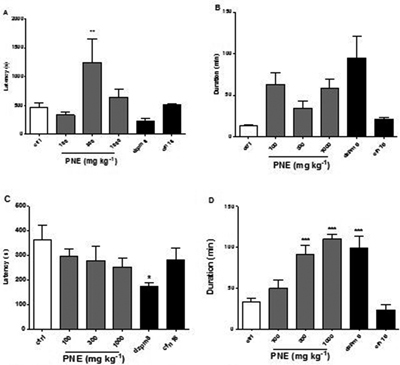 Male ICR mice were treated with PNE (100 to 1000 mgKg-1 p.o.) and sleep induced with sodium pentobarbitone (50 mgKg-1 i.p. ), first after an hour and in another experiment, 30 min after pretreatment with PNE to assess the onset of drug action. In both cases, mice were observed for latency and duration of sleep. Results: Initially observed CNS stimulating effect of PNE marked by hyperactivity progressed steadily into depressive action. PNE significantly enhanced sleeping effects (P < 0.001, F5,32= 13.86) in a dose-dependent manner indicating a depressant-like effect Figure 1. LD50 of PNE was approximately 3000 mgKg-1. PNE acts biphasically; an initial temporal CNS stimulation and a sustained sleeping effect. Data presented as group mean ± SEM (n = 6); *P < 0.05, **P < 0.01, ***P < 0.001; compared to vehicle treated group, P > 0.05 = not significant (One-way ANOVA followed by Newman-Keuls' test). Burkill Royal Botanic Gardens, Kew; 1995; 168 – 169.